If you linked to the LowestPriceTrafficSchool.com website from another website, the address of that website. When you visit some websites, their web servers generate pieces of information known as cookies. Some cookies collect personal information to recognize your computer in the future. This is not the case at dmvtestcheats.com, where we only use non-persistent cookies or "per-session cookies." These cookies do not collect personal information on users and they are erased as soon as you leave our website. Per-session cookies serve technical purposes like providing seamless navigation through dmvtestcheatsheets.com. These cookies do not permanently record data and they are not stored on your computer's hard drive. dmvtestcheats.com cookies are stored in memory and are only available during an active browser session. Again, once you close your browser, the cookie disappears. If you choose to provide us with personal information -- such as completing a Contact Us form with personal information and submitting it to us through the website -- we may use that information to respond to your message and help provide you the information you have requested. We only share the information you give us with other parties if your inquiry relates to that party, or as otherwise required by law. dmvtestcheats.com never collects information for sale to third parties for marketing purposes. 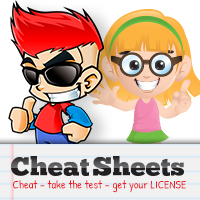 DMVtestCheatSheets.com links to many websites created and maintained by other public and/or private organizations. DMVtestCheatSheets.com provides these links as a service to our users. When users link to an outside website, they are leaving the dmvtestcheats.com site and are subject to the privacy and security policies of the owners/sponsors of the outside website(s). DMVtestCheatSheets.com will not link to any website that exhibits hate, bias or discrimination. Furthermore, dmvtestcheatsheets.com RESERVES the right to deny or remove any link that contains misleading information or unsubstantiated claims, or is determined to be in conflict with dmvtestcheats.com's mission or policies. The information posted on the dmvtestcheatsheets.com website includes hypertext links or pointers to information created and maintained by other public and/or private organizations. Dmvtestcheats.com provides these links and pointers solely for our users' information and convenience. When users select a link to an outside website, they are leaving the dmvtestcheats.com site and are subject to the privacy and security policies of the owners/sponsors of the outside website. DMVtestCheatSheets.com does not control or guarantee the accuracy, relevance, timeliness or completeness of information contained on a linked website. DMVtestCheatSheets.com does not endorse the organizations sponsoring linked websites and we do not endorse the views they express or the products/services they offer. DMVtestCheatSheets.com cannot authorize the use of copyrighted materials contained in linked websites. Users must request such authorization from the sponsor of the linked website. DMVtestCheatSheets.com is not responsible for transmissions users receive from linked websites. DMVtestCheatSheets.com does not guarantee that outside websites comply with Section 508 (Accessibility Requirements) of the Rehabilitation Act. While the information and recommendations contained in this website including courses, tests, publications, and newsletters have been compiled from sources believed to be reliable, Dmvtestcheats.com makes no guarantee as to, and assumes no responsibility for, the correctness, sufficiency, or completeness of such information or recommendations. Other or additional safety measures may be required under particular circumstances. Information contained within DMVtestCheatSheets.com's website is the property of the LowestPriceTrafficSchool.com. Permission for re-publication in any form must be obtained in writing from: LowestPriceTrafficSchool.com, PO Box 442288, Jacksonville, FL 32222. Fax (888) 977-3809. E-mail: support@LowestPriceTrafficSchool.com. © 2019 DMVTestCheatSheets.com | All Rights Reserved.